"Where the Magnificent Hunter meets the Mighty Goulburn"
Denman is located in the Upper Hunter Valley of NSW and has a population of 1500 in the township. The Hunter River is met by the Goulburn River system just 2km southeast of the township. The Hunter has a constant flow of water, thanks to Glenbawn Dam at the head of the system which was opened in 1957. On the other hand the Goulburn River whose catchment extends to the Great Dividing Range in the west has no dam to regulate its flow. During extended dry periods the Goulburn ceases to flow, although there still remains an abundant supply beneath the bed of the river. This is sourced via spear points placed in the subterranean gravel beds by the many farms and vineyards along its length, particularly in the lower half of its length. The might of the Goulburn in flood flow has to be seen to be believed, at Yarrawa bridge 5km from Denman the flow has been clocked at around 60kmh during these high flows. 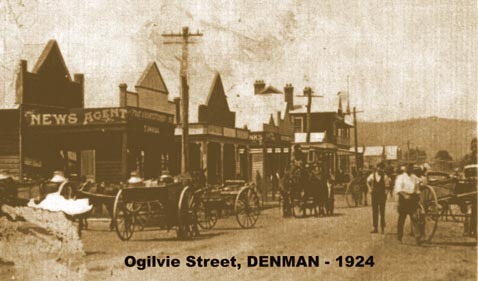 Denman was originally settled as "Merton" in 1825 by Lt. William Ogilvie, on the eastern side of the Hunter River and directly east of the current town. As years passed by the settlement moved closer to the river and eventually crossed the Hunter River. Some sections of the original "Merton Homestead" remain on the "Merton" property. Merton cemetery remnants still remain (on private property) on top of a hill northeast of Denman. A son of Gregory Blaxland (George), of Blaxland, Lawson and Wentworth fame (first to cross the Great Dividing Range in 1813) is one of many buried here, in 1849 at the age of 46 years. The name Denman was gazetted in 1855, named after Lord Denman, who was later to become the 5th Governor General of Australia in 1911-1914, with the town well and truly establishing on the western bank of the Hunter River. Subsequent flooding of the river continued to push the village west away from the river banks to its present site, which still partly flooded up until 1988 when a levee bank was constructed to protect the town. The most memorable flood in living history has been the 1955 event. 3 large 2 storey homesteads from the districts early beginnings still remain, all in excellent restored condition and occupied. Whilst they are generally not available for seeing through they can all be seen from the road which passes by. Pickering Homestead is located just 5km north of Denman, Martindale Homestead is located approx. 15km south of Denman in the Martindale locality and Baerami Homestead is located on Baerami Creek Road approx. 30km southwest of Denman. Another major event in the town, a disastrous fire, occurred on November 8th, 1928, which is well documented in photographs. Pictured below is how Ogilvie Street (northern side) looked in 1924 and the next photograph taken during the fire. 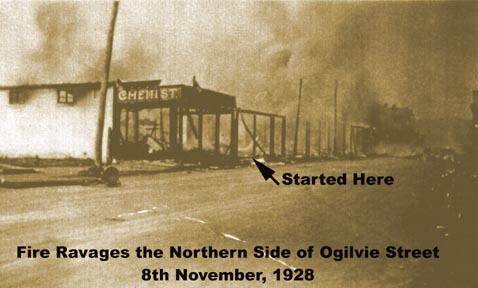 This was a large fire which destroyed all but 2 buildings, one being the Royal Hotel, on the northern side of Ogilvie Street (Our Main St). It is reported that the day was extremely hot (around 40 deg C.) with a strong westerly wind blowing. The fire started in the movie film projection room in the Town Hall. 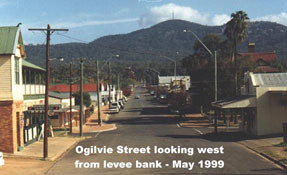 That section of Ogilvie Street was rebuilt with most of the buildings still remaining and occupied to this day. Denman District started out as a major agricultural area, predominately dairy farming, which reached a peak in the 1950/60's. Whilst many dairies have since closed for a variety of reasons, milk is still produced at the levels of that peak time. A flour mill was built around 1865, becoming a Butter Factory around 1907, with the sandstone building still standing in Jerden Street on the banks of the Hunter River and now owned and used by the Denman Masonic Lodge. The Butter Factory moved to larger premises north of Kenilworth Street in 1924, closing in 1942, becoming a milk (in 10 gallon cans) transfer depot for several years, whilst operating as a Freezing Works. Many millions of rabbits were processed through this facility at the time of the rabbit plague. This facility closed and was reopened as a lucerne pelleting factory in 1974 which unfortunately didn't survive long due to the drastic increase in the cost of fuel used to fire the furnaces in the late 1970's. The building was demolished in 1982 and the area was developed into a housing cul de sac, Fontana Way. Apart from dairying, the major agricultural pursuits in the area are now, wine production from the many vineyards in the area, horse studs, beef cattle production, lucerne hay production. Many people are also employed in the large coal mining operations, both open cut and underground, in the Upper Hunter as well as the 2 major power stations of NSW, Bayswater and Liddell, operated by Macquarie Generation. Of course many other people are employed in businesses associated with all these major industries. A railway line was constructed from Muswellbrook to Denman in 1914 and continued to Merriwa in 1917, passing through Denman west of Virginia Street. In the 1930's work commenced on the construction of a railway line from Sandy Hollow to Maryvale (between Wellington and Dubbo). After several starts and stops the work was abandoned in 1951. In 1980 White Industries recommenced the construction in order to move coal from their Ulan Coal Mine Operations to the Port of Newcastle. The line was officially opened in 1982. 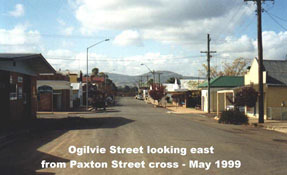 The line was later extended to Gulgong to link up with western NSW lines. During the construction phase White Industries established their construction office in Denman. This project also necessitated the construction of a concrete sleeper factory adjacent to the rail line in Denman. The sleeper factory was operated by Rocla (later Amatek). This factory closed in 1992 with the loss of around 30 jobs, although 2 factories were established at Grafton and Bowral in northern and southern NSW. Some of the Denman staff moved to one or the other of these sites with the company. Not much remains of early Denman, however the St. Matthias Anglican Church, built in 1874, with architect Horbury Hunt is a popular site as is the Court House, which now is a private residence, but retains its original outward appearance. Denman has been the scene for a number of films/TV shows or parts thereof. The Royal Hotel featured in the original movie "The Shiralee" filmed in the early 1950's. A Disney film "Born to Run" was filmed in Denman's main street and surrounding district in 1976 with many locals filling the roles of extras. An episode of G.P. 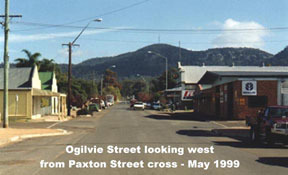 (top rated ABC program) was also filmed in Denman's main street in 1996. To the south of Denman lies the enormous expanse of Wollemi National Park and to the immediate west of Sandy Hollow lies the large Goulburn River National Park. Sandy Hollow (Village), Martindale, Horseshoe, Glen Gallic, Yarrawa, Dalswinton, Mangoola, Hollydeen, Baerami, Baerami Creek, Giants Creek, Wybong, Bureen, Kerrabee, Widden Valley. Denman, like many other places, identifies with their Rugby League Football Club. The "Denman Devils" colours are maroon and white. Royal Hotel and Denman Hotel, St. Matthias Anglican Church, Court House, Vineyards / Wineries, Horse Studs, Widden Valley - Horse Studs and Scenic Drive, Wollemi National Park, Goulburn River National Park, Pickering Homestead, Baerami Homestead, Martindale Homestead. Police, NSW Fire Brigade, NSW Rural Fire Service, Denman VRA Rescue Squad Inc., State Emergency Service. St. Matthias Anglican Church (Phone: 02 65472243), St. Bernards Catholic Church (Phone: 02 65472375). Primary School: Denman Public School (Kindergarten to Year 6), St. Joseph's Catholic School - Denman (Kindergarten to Year 6), Martindale Public School (Kindergarten to Year 6), Sandy Hollow Public School (Kindergarten to Year 6). High School: Available by bus service at Muswellbrook, Merriwa (both public), Aberdeen (Catholic education facility) and Scone (Anglican education facility). All Schools have Parent and Citizen (P. & C.) or Parent & Friends (P. & F.) Associations. Denman Apex Club, Denman Rotary Club, Denman Lions Club, Country Womens Association, Legacy, Red Cross, Denman Masonic Lodge, Denman Neighbourhood Centre, Denman Senior Citizens, Merton Court Retirement Hostel, Denman View Club, Denman Scouts, Denman and District Safety House Association, Denman Anglican Womens Guild, Denman Anglican Mothers Union, Denman Hospital Auxilliary, Denman Youth Group. Denman Rugby League Football Club, Denman Cricket Club, Denman Bowling Club (Mens and Womens), Denman Golf Club, Denman Swimming Club, Denman Squash Club, Denman Basketball Association, Denman Motor Cycle Club, Denman / Sandy Hollow Junior Rugby League Football Club, Denman Junior Cricket Club, Denman Little Athletics Club, Denman Hockey Club, Denman Pony Club, Denman Endurance Riders Club.